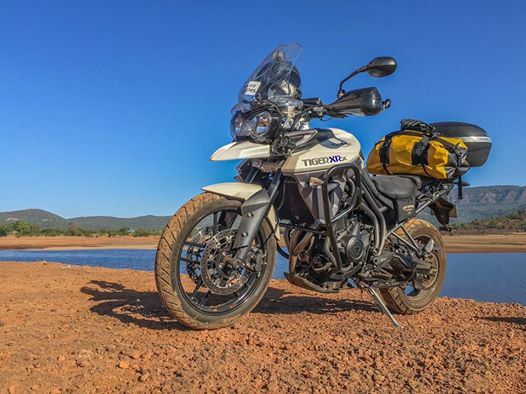 I’ve been experimenting with luggage configurations on my Triumph Tiger 800 XRx. I’ve been wanting to avoid panniers mainly because they drastically increase the width of the motorcycle which prevents filtering through traffic jams or slow moving traffic. I face this problem with my Fat Boy and it’s irritating to a point where I start wondering why I chose to ride instead of drive. I need to patiently sit on the huge and heavy motorcycle in the blistering heat armed to the teeth in all my riding gear while I watch other motorcycles nimbly squeeze their way through traffic jams. In a country like India it’s important to factor stuff like this. Otherwise you could end up ruining the entire riding experience. I’ve zeroed down to two pieces of luggage. A 48 litre SW-Motech T-Ray top case and a 40 litre Wolfman Expedition dry duffel bag. The top case holds all my tools, medical kit, air compressor, puncture repair kit, towing rope, computer, etc. and clothes for any number of days. This is assuming I’ll be staying in hotels. If I’m camping out then I need to carry the duffel bag which holds the tent, sleeping bag, sleeping mattress, stove and utensils. This worked very well for me on this weekend’s overnight camping at Dajipur in Maharashtra. I even thrashed the fully loaded adventure motorcycle up and down a long and dusty trail through the Dajipur wildlife sanctuary and everything worked well. This tells me that I could ride anywhere in India for any number of days. So it looks like I’m not going to be shopping for panniers for my Tiger anytime soon. Here are links to where I bought these two products.